Woman Claims Insurance Company "Sold Her Out"
California Department of Insurance officials say when insurance companies reach different conclusions than police in auto accidents, they need to explain why. A Lancaster woman says her auto insurance company sold her out, raising her rates after finding her daughter "at fault" for hitting a pedestrian, when police cited that same pedestrian for causing the accident. Allison Kemper cried when she recalled the moment she hit a teenage girl, who landed on her windshield after darting in front of her on Avenue J in Lancaster. In a couple of hours NBC4 watched lots of people crossing Avenue J, from both sides, standing in the median with cars whizzing by. "She was looking the opposite way and she just started running and I had to stop really quick," Kemper said. The girl Kemper hit was not seriously injured. 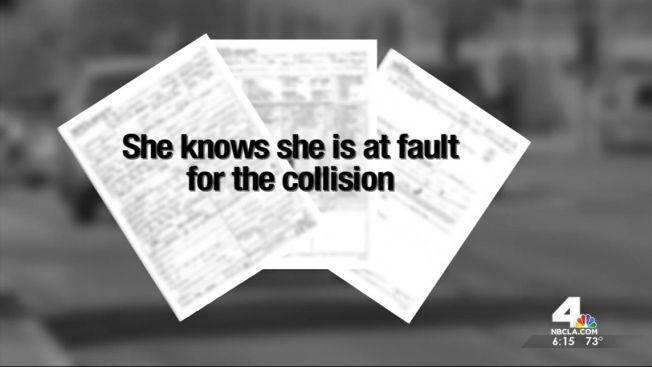 According to the California Highway Patrol traffic collision report, the pedestrian told officers, "she knows she is at fault for the collision." She was cited for "failing to yield the right of way of oncoming traffic when crossing at a non-crosswalk intersection." The teenager paid a fine, but it's Kemper who's paying the price. She was not cited," said Lisa Kemper, Allison's mother. "It's not on her DMV record. It's only according to the insurance." Kemper's mother says AAA insurance found her daughter at fault, and sent them a letter saying, "your vehicle violated the pedestrian's right of way," raising her insurance rates by $500. The state Department of Insurance has the authority to look at what AAA did here and determine if they adhered to the regulations that are required in order to protect the consumer, said Nancy Kincaid, a spokeswoman for the California Insurance Commissioner. AAA claimed the girl was in a crosswalk at an intersection, which contradicts the police report and Kemper says AAA gave her other reasons for their findings. "They wanted to save us from being sued and they said it was because she was a minor," Lisa Kemper said. AAA officials said late Monday they were going to refund her money and restore her driving record. If your rates have been increased from an accident in which you weren't found at fault by police, contact the California Department of Insurance. They have the power to investigate your insurance company. For more information, call 800-927-4357 or visit www.insurance.ca.gov.